Why Should You Own an SUV? An SUV has many benefits. We at Denham Ford love helping people find the right SUV for their lifestyle. 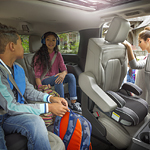 Whether you love to travel, go off-roading, need a vehicle to haul around cargo, or need something reliable to get the kids to after-school activities, we can help you find an SUV. One of the best benefits of an SUV is seating for passengers. You may choose one that has a third-row seat, so you can seat 7 easily. This is great for events and carpooling. Newer SUVs have better gas mileage. This allows you to drive a bigger and safer vehicle, while not worrying so much about gas prices. Filling up the tank isn't so bad when you can go farther with your vehicle. Getting everything into an SUV is easier when you can fold down the rear seats and fit a lot of items in the back of an SUV. Getting everything into the vehicle is much easier than the trunk of a car.